This past Friday night Nintendo hosted Los Angeles's most happening party. 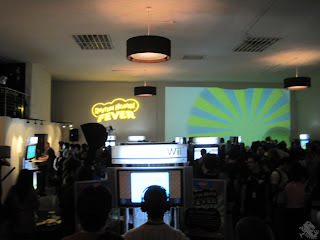 A special event for the launch of the new Nintendo Wii game Rhythm Heaven Fever. The event was open to anybody on a first come first serve basis so we were quick to make our way down to the iam8bit gallery in LA. We arrived a fair bit early, but luckily many of our friends from the various StreetPass Network groups were out in full force. 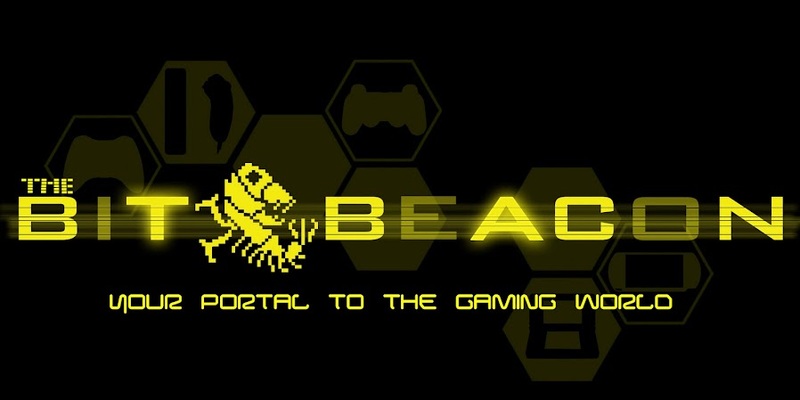 The organizers of StreetPass OC, LA, and IE were all out and about. and much of the evening was spent clearing out hundreds of StreetPass tags. But at 6pm the doors opened and we were let in. 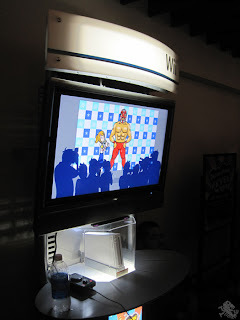 There were many demo stations set up with the full retail version of the game. The one mini-game I played was called 'Double Date'. The objective was to kick soccer, basket and footballs out of the way during your date in park. The balls would bounce to the rhythm and you would have to kick them at the precise moment in order to clear them from the area. While the tutorial could be a bit grueling, especially when people are standing behind you waiting for their turn, when the game gets going it is a lot of fun. The last rhythm game I played was Doneky Konga, and this event convinced that I need to give Rhythm Heaven Fever a shot when it launches Sunday, February 12th. Lots of free goodies were given out such as t-shirts, food and even alcoholic beverages! A DJ was on hand providing beats which honestly made it kind of harder to play the actual game, but it made for a cool atmosphere I had never seen at a Nintendo event before. There was definitely a more mature crowd present, very few young kids, mostly adults. Lots of time to mingle and meet new people. Aside from the actual game there were a few other activities to take part in. 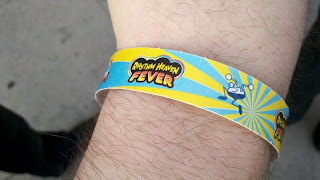 One had us dancing in front of a webcam for a video that will later be uploaded to the Rhythm Heaven Fever website. Another activity was a photo op area where you could pose with friends using real life props based after objects in the game. All in all it was a fun evening, big props to Nintendo for putting this together and to iam8bit for hosting the event. I can only hope that LA will get more Nintendo love in the future, cause this was a great time and I want do it again soon!